I love your thinking here – a great post. There a retimes in my life that have been dark and it’s getting through each moment, one after the other. Even now I question who I am and where my happiness and strength is. There are still times in my life where I feel the same way. Taking things one moment at a time, and not questioning ourselves is the best mode of attack. I’m with you, you kind of have to live in the here and now. Wow. Thank you for writing this. I struggle almost daily to realize the strength I’m using when it feels so much like I’m little more than pathetic. The running dialogue in my head can be so brutal. I see my failures (as a mother, a wife, even a human being) more than my successes. I try so hard to change those thoughts. You’ve written a great mantra and I will be using it!. Thank you. 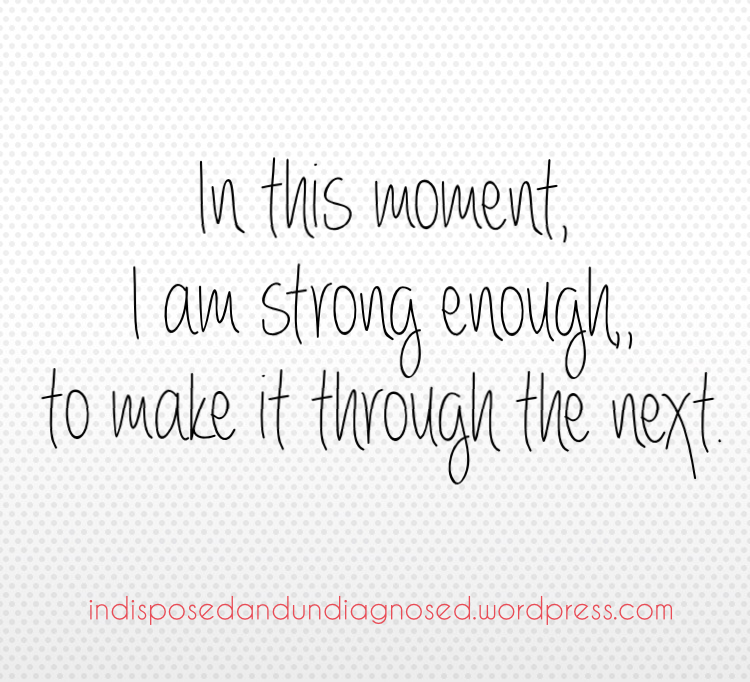 Slowly, I’ve been coming to realize that chronic illness strength is definitely a different kind if strength. And I’m realizing it’s the kind of strength that I think I’ll be more grateful for in the long-run, because it seems deeper and more permanent.